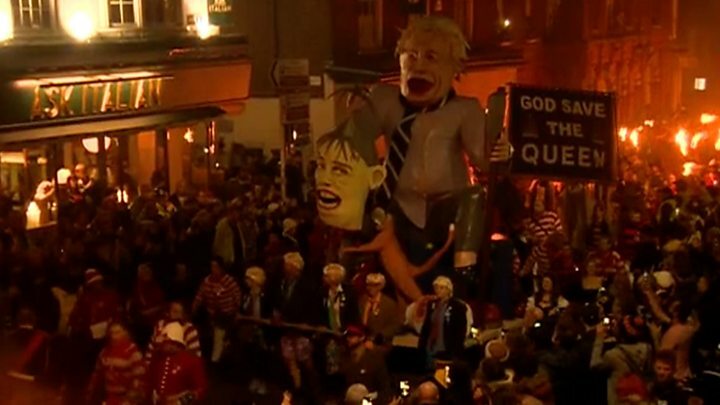 Prime Minister Theresa May, Boris Johnson and a strike-hit rail firm went up in smoke at the annual bonfire celebrations in Lewes. 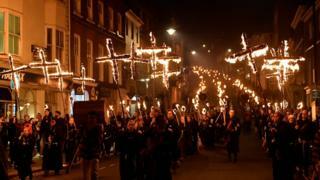 Up to 30,000 people turned out to watch effigies of the three divisive figures go up in flames. 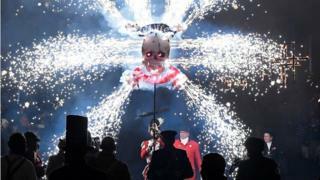 The event, staged by six bonfire societies, is renowned for burning satirical images of high-profile people. Rail operator Govia Thameslink (GTR), also came under fire during the event. 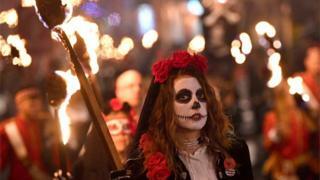 Lewes Borough Bonfire Society (LBBS) created a “ghost train” criticising the firm for not stopping in the town. Lewes was one of the towns hit by major disruption during a prolonged dispute between Govia Thameslink and the unions over railway working practices. 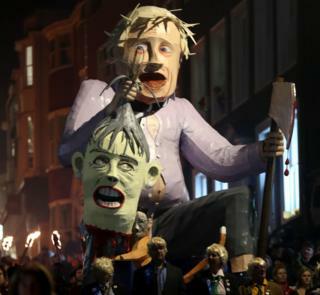 Other effigies included one of Boris Johnson wielding a bloody axe and what appeared to be the severed head of Prime Minister Theresa May. Early sightings of effigies of Mrs May found their way on to social media during the preparations for the big night. 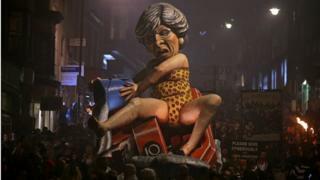 Another effigy appeared to show Mrs May driving a red Brexit bus off a cliff with the Beachy Head lighthouse to one side and Jacob Rees-Mogg on the back. 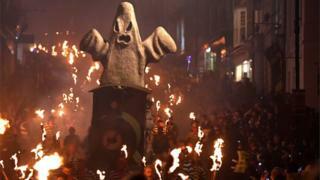 As many as 60,000 people have attended Lewes Bonfire Night in the past. In 2017, an effigy of North Korea leader Kim Jong-un was paraded through the streets, and models of Donald Trump, Vladamir Putin and Syrian president Bashar al-Assad have also gone up in flames in previous years. In 2011, Libya’s ex leader Col Muammar Gaddafi’s effigy was burned, a month after he died following the uprising that ended his 40-year rule. Sussex Police said 70 people were treated for mostly minor injuries. Two teenagers were arrested on suspicion of assault occasioning actual bodily harm and possession of a class A drug, with one remaining in custody. A 19-year-old woman has been charged with using threatening, abusive or insulting words or behaviour, likely to cause harassment, alarm or distress. Road closures and parking restrictions were in place and no trains were calling at Lewes, Falmer, Glynde or Southease until Tuesday.